Alright, Wakai-san, I’d like to ask about the overall sound. From your point of view, what was the challenge this time with regard to the music? The orchestra. It wasn’t entirely new because of the Tokyo Software Development Department’s experience with games like Super Mario Galaxy7, but I think this was the first time for EAD in Kyoto to use an orchestra. 7Super Mario Galaxy: A 3D action game released for the Wii console in November 2007. The second game in the series, Super Mario Galaxy 2, was released in May 2010 in Japan. The Legend of Zelda: Twilight Princess did partially feature orchestral music, but that part was done by the Tokyo Software Development Department, too. So without any know-how, it was quite a challenge. Did you receive any advice from Tokyo Software Development Department? Yes. (Mahito) Yokota-san8 - who knows a lot about orchestral music - is there, one other staff member came on board, and we asked the Tokyo Software Development Department to be in charge of a number of music tracks for cinematic scenes, as well as making arrangements related to recording the orchestra. In Kyoto, we focused on other music in the game. That’s how the sound team came to have ten people. 8Mahito Yokota: Tokyo Software Development Department, Entertainment Analysis & Development Division, Nintendo. He has worked on the sound for series such as Super Mario Galaxy. He was also in charge of the orchestral music in The Legend of Zelda: Twilight Princess. Without the music in the cinematic scenes, could you have proceeded with a smaller staff? Yes. One about half the size. So you can say that due to the cinematic scenes, your staff doubled. It must have been hard to put music to all 120 minutes of cinematics, though. It was. Besides, all ten of the sound staff members weren’t working full-time on this game, and we had our hands full just putting music to the game, but toward the end, the cinematic scenes rapidly came together. That’s when the staff suddenly grew. 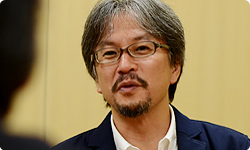 Aonuma-san, how was it decided to record with an orchestra this time? At first, I wasn’t thinking about using an orchestra at all. But during the roundtable at E3 20109, a reporter asked if we would use an orchestra for The Legend of Zelda, and Mr. Miyamoto replied: “An orchestra suits The Legend of Zelda, so we’ll be thinking about it.” When I came back to Japan, Wakai-san came up to me in a fluster and said, “Is the music going to be orchestral this time? !” I said, “No, I don’t think so.” 9E3 (Electronic Entertainment Expo) 2010: A video game trade show usually held once a year in Los Angeles. Attendees of E3 in 2010 were able to experience The Legend of Zelda: Skyward Sword for the first time. Oh, so Miyamoto-san gave you a push? Yes. He said that something like that is necessary for a game like The Legend of Zelda. It really was a surprise. You all say it was a surprise, but didn’t we use an orchestra for Super Mario Galaxy? Yes. We felt like it worked in Super Mario Galaxy, so I suppose that is why Miyamoto-san was sure that if we used that impressive sound in The Legend of Zelda it would turn out great. And it was well-received in The Legend of Zelda: Twilight Princess. I see. (laughs) And that led to The Legend of Zelda 25th Anniversary Symphony Concert10. 10The Legend of Zelda 25th Anniversary Symphony: An orchestral concert held at Sumida Triphony Hall in Tokyo on October 10, 2011. The music was performed by the Tokyo Philharmonic Orchestra conducted by Mr. Taizo Takemoto, once during the day and once at night. In the UK it was held at the HMV Appolo in London on 25th October. The concert coverage can be seen at the Zelda 25th anniversary website. You were on stage at that concert. How was it? It was really exciting. Many people even cried as they listened to the music from the series. I was listening from the side of the stage, but it touched a special place in my heart such as I’d never felt before. Just listening to the orchestra, it gradually came over me. Then all that I had experienced in the game welled up inside me. Kondo-san11 said that it brought tears to his eyes, too. Apparently he was even tearing up during rehearsal. (laughs) 11Koji Kondo: Software Development Department, Entertainment Analysis & Development Division, Nintendo. 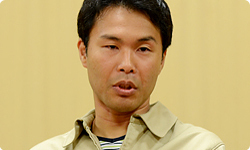 He has composed many music tracks for series like target=nintendo>Super Mario and The Legend of Zelda. Were you there for the concert? Yes. It made an impression on me how the eyes of everyone in the hall were sparkling. The power of music is incredible. I truly believe so. I couldn’t go, but I experienced how incredibly powerful an orchestra can be. About February this year, everyone on the development staff was in a tired spell. During a long development period, times like that arise. Everyone had powered down. As if choosing just such a time, the sound team used the sound room to hold a preview of the orchestral music done at that point. Listening to it boosted everyone’s motivation. Their spirits rose a hundredfold? Yes. Their energy shot up. People in the sound staff could really tell that everyone in the staff was exhausted. In order to raise their motivation, we decided to hold that event. We were really happy listening to it. Yes! (laughs) I think because of that preview we were able to stick with development to the end, trying to make a game that would live up to that music. I see. Lastly, I would like each of you to say something to the fans about what you would like them to pay attention to in the game. Since we’ve been talking about the sound, would you start, Wakai-san? With regard to the sound, we tried something new by putting in an orchestra, but here and there you will find characters who sing, and they sing during the cinematic scenes, too. Yes. (laughs) Lots of characters appear this time, and they all have their own thematic sound. We have used those to good effect all over the game, so I hope players will enjoy that. And another thing is how you can play the harp this time using Wii MotionPlus. (Masato) Mizuta-san from Sound mentioned that. You can play the harp even while walking. Yes. And while you run, too. The sound changes along with the background music, so I hope everyone will look forward to that.